The PDFs below comprise the Rome Dam Assessment report submitted by MMI in March of 2017. Due to document sizes, Appendix A - Literature Review and Archaeological Survey is omitted and Appendix J of the report is summarized by Figures A and B. On the left, the haul road is evident down to the dam cascade. Minutes later on August 22, 2018 the first cuts begin with the project team watching. The initial hammer work up close. The impoundment is visible upstream. Water begins to track to the low point and the spillway goes dry. Water levels downstream are carefully controlled to ensure "run of river" or constant normal flow conditions. Site preparation work to remove the J. & J. Rogers Company pulp mill dam on the West Branch of the Ausable River began on August 2, 2018. Engineering firm Milone and MacBroom, Inc. (MMI) of Vermont completed the engineering design this spring. MMI and AsRA completed permitting requirements by summer. In July, Essex County awarded the deconstruction contract to Reale Construction, Inc. of Ticonderoga. The final engineering designs and full project narrative are available via the links on the left sidebar of this page. AsRA will follow the deconstruction process and post images here and on our Facebook page where video will also be made available. The initial partial dewatering is scheduled to commence on, or soon after Monday 20 August. Work is expected to last several weeks. The project has permits in place to continue work beyond the usual September 30 in-water deadline required by NYS Department of Environmental Conservation, but will be completed by November 15th, 2018. Rome Dam is 38 feet tall and 103 feet long with a concrete gravity ogee spillway and stone masonry abutments. It is approximately 1.5 miles upstream of the confluence of the East and West Branches of the Ausable River and the hamlet of Au Sable Forks. Built in 1893-4 and most recently rebuilt in 1936, the dam provided process water and mechanical power for the J. & J. Rogers Company pulp mill, the first phase in its paper-making operation. Rome Dam has not been maintained since 1971, when the Rogers Co. ceased operation. (Read about the history of the dam here.) Deterioration of the dam has occurred. Cracks and spalling exist in the spillway and abutments. The river left abutment gets outflanked during high water and the abutments appear to be undermined. All outlet works are inoperable, collapsed, and leaking. Sediment and large wood are lodged in the outlet works. NYS DEC has listed the dam as structurally unsound. The dam is a high hazard (Class C) structure since its failure would lead to loss of life and damage to property in the downstream community. The MMI study confirmed the high hazard rating of the dam and clearly showed that the structure is increasing downstream flood and erosion risks. Rome Dam is slated for deconstruction in 2018 during low water in summer and early autumn. The project is anticipated to take two to three months, depending on weather and construction equipment allocations. Please refer to the final design plans prepared by MMI and dated March 7, 2018 for project details. Specific sheet references are made in this document to direct the reviewer to additional information. Tree removal will take place in three designated areas to allow access and dam removal (see SP-5). Ninety-two (92) trees will be removed: thirty-four (34) of less than 2” in diameter; twenty- four (24) that are 2-3” in diameter, and thirty-four (34) of greater than 3” in diameter. Species include pine, northern white cedar, red oak and hemlock. Existing native vegetation will be preserved and protected, as possible. Any native vegetation or topsoil removed will be stockpiled and reinstalled, as possible. The heavy work will start by building construction access to the dam from the existing haul road (see SP-5). Then, the impoundment will be dewatered initially by notching the dam first on river right and then on river left (see SP-6). The first notch will expose built up gravel that can serve as the base of a haul road across the front face of the dam. Dewatering will continue with the goal of moving the flow to river left. Dam removal will take place incrementally to remove consolidated sediment and lower the concrete spillway. The timber crib structures will be removed as accessible. Channel restoration will take place as sediment is removed (see CS-1 and PRO-1). Approximately 37,000 cubic yards of sediment will be excavated and pushed to the river right corner of the dam at the access location. The material will be piled, drained, and loaded up to waiting dump trucks. Two piles are anticipated to generally separate coarse and fine sediment. The material will be hauled to two upland sites. Sand, silt, concrete, and stone masonry will be hauled to the Town of Jay gravel pit. Gravel, cobble, and boulder will be hauled a site for stockpiling and reuse in future river restoration projects by the Ausable River Association. Both sites are approved for receiving material. The dam will be completely removed to underlying bedrock (see REM-1). Following removal, the downstream scour hole will be partially cleaned out to reestablish the proposed channel profile (see PRO-1). Side slopes where the dam abutments were located will be regraded as needed, since they are mostly bedrock. 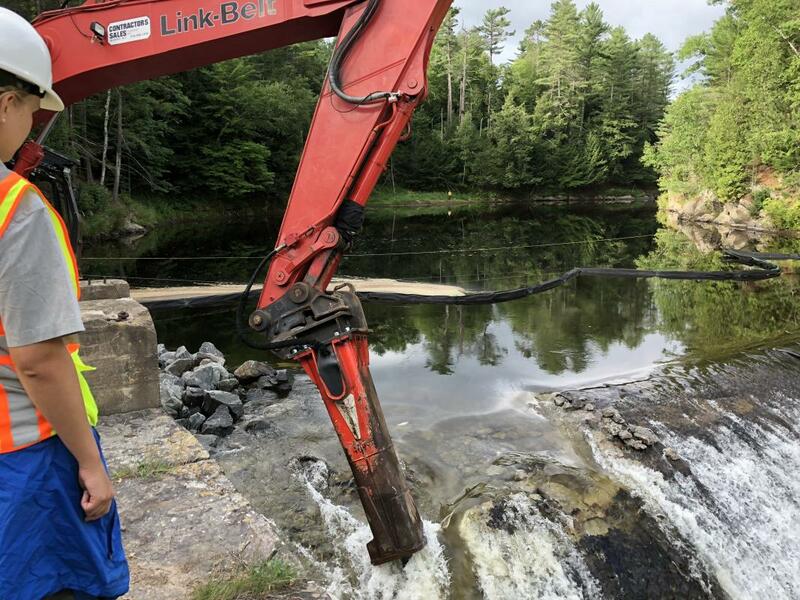 The dam removal will lower water levels at the dam site nearly 20 feet on the West Branch Ausable River (see PRO-1). Once deconstruction is completed, the temporary access roads will be restored with native vegetation leaving a narrow footpath down to the former dam site. A small, level existing opening will be maintained and will serve as the terminus of the footpath. The site is frequented by local residents who hike along the bank above the river on informal trails. Removal of the dam will reduce flood risk, enhance instream habitat, improve water quality, increase the potential for geomorphic stability on the West Branch, and provide the public with a stunning view of a state-designated Recreational River. On March 9, 2017, the Town of Jay Board unanimously passed a resolution to remove the Rome Dam. The dam is 38 feet tall and 103 feet long and has a concrete gravity ogee spillway. It is approximately 1.5 miles upstream of the confluence of the East and West Branches of the Ausable River and the hamlet of Au Sable Forks. Built in 1893-4 and rebuilt in 1936, the dam provided process water and mechanical power for the J. & J. Rogers Company pulp mill, the first phase in its paper-making operation. For many residents, the dam is a reminder of the days when Au Sable Forks was a prosperous industrial center. Rome Dam has not been maintained since 1971, when the Rogers Co. ceased operation. Significant deterioration has occurred: cracks in the spillway and abutments, seepage undermining the abutments, inoperable and collapsed intake penstocks, and sediment and large woody debris lodged in the intake structure. New York State has listed the dam as structurally unsound. The risk of dam failure is high. 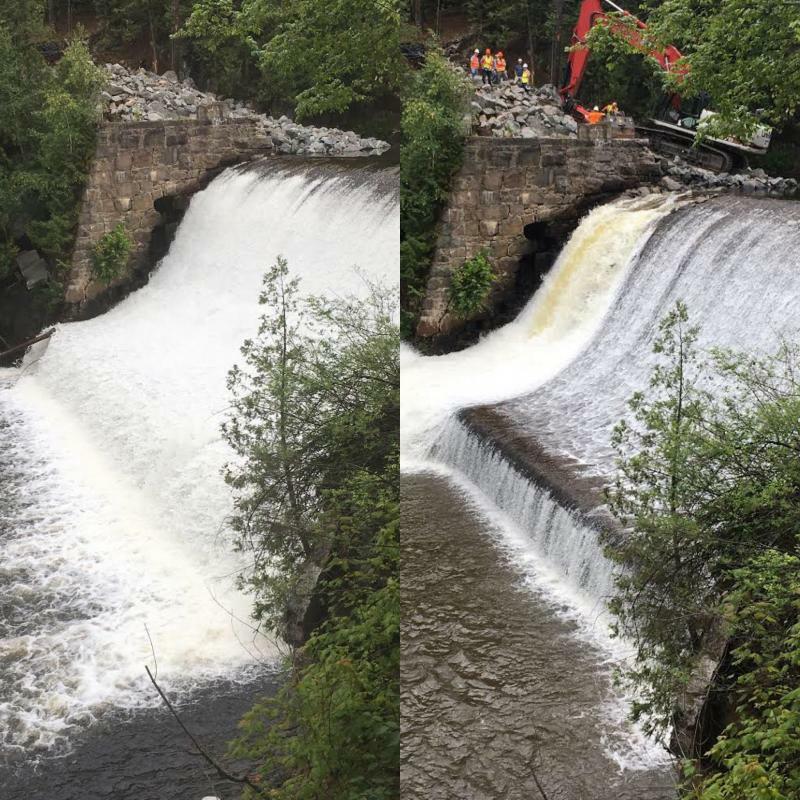 Assessing the safety of the Rome Dam, and planning for its removal if the structure was confirmed hazardous, was a priority in the Town of Jay's NY Rising Community Reconstruction Plan, assembled in the aftermath of Tropical Storm Irene. 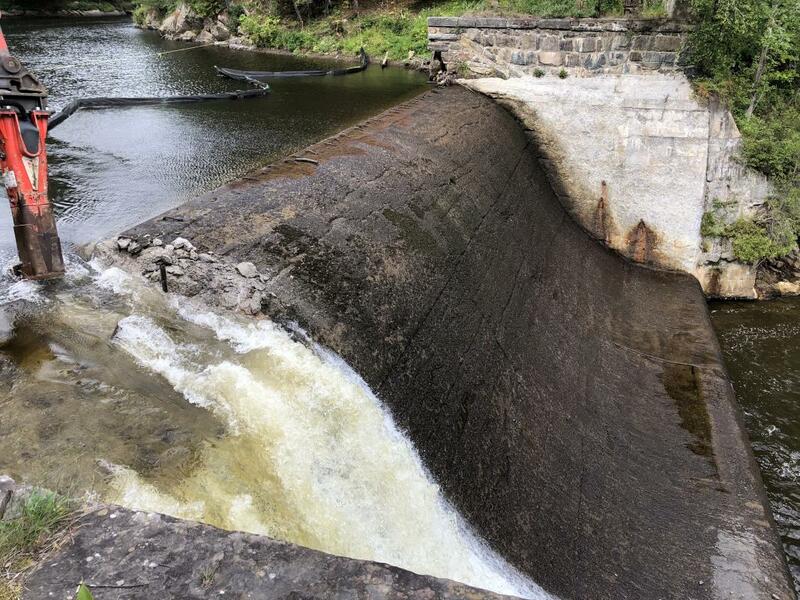 In 2015, with funds from the Governor's Office of Storm Recovery, the town contracted with the Vermont-based engineering firm Milone and MacBroom, Inc. (MMI), to assess the Rome dam. The study, conducted in 2016 - 2017, evaluated six alternatives--no action, full removal, three quarters removal, half removal, repair, and replacement--with the following objectives in mind: improve safety, reduce flood risk, reduce erosion risk, meet modern spillway requirements, improve water quality, reduce the town's financial exposure, limit implementation costs, and reduce maintenance costs (see Appendix K at left). Maintenance costs include insurance, accumulated state safety fines in excess of $4 million, and maintaining the structure to state and federal standards. During the study, MMI and Town of Jay representatives met with numerous advisors to share information and discuss alternatives. A public meeting was held at the Town of Jay offices on March 2, 2017. "The results of the alternatives analysis suggest that full removal of the Rome Dam should take place to maximize public safety, reduce liability, naturalize the river, and eliminate long‐term costs at the site," MMI concluded. "Full removal is the only alternative that eliminates all dam safety requirements, downstream risks, and financial exposure associated with the existing dam. The main disadvantage of dam removal is loss of a historic Adirondack industrial dam. This loss can be offset with proper documentation and signage honoring the dam's existence. "Full removal is the preferred alternative as it meets the most project objectives for the lowest cost. The anticipated cost to implement this alternative is $2.5M to $3.0M. No maintenance costs will exist following dam removal. Design, permitting, and deconstruction of the dam are the next steps to complete the removal." As a resource to the public, AsRA is providing the MMI report and most appendices. Use the links in the sidebar to the left.